Größe dieser Vorschau: 371 × 600 Pixel. Weitere Auflösungen: 148 × 240 Pixel | 297 × 480 Pixel | 800 × 1.293 Pixel. 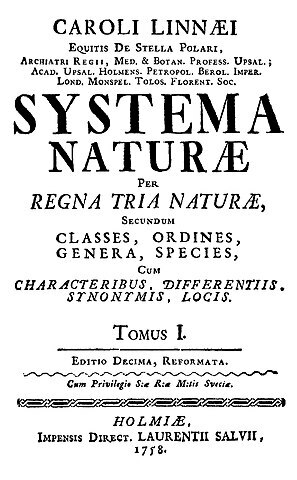 English: Title page of the 10th edition of Systema naturæ written by Carl Linnæus, published in 1758 by L. Salvius in Stockholm. Digitized in 2004 from an original copy of the 1758 edition held by Göttingen State and University Library, signature <8 H NAT I, 7105 <10>:1>. Uploaded by Francisco Welter-Schultes, I personally checked that the original copy was identical with the digitized version. 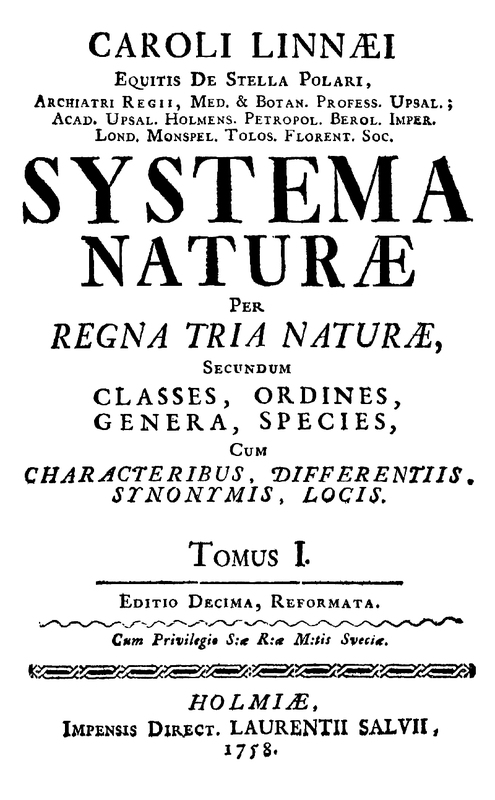 This is the original title page of the famous 1758 work which provided the base for modern zoological nomenclature. This image can be taken to illustrate the original work of Carl Linnæus. 01:14, 10. Aug. 2010 800 × 1.281 (1,1 MB) Kryp Added some tan. The original digitized version was bitonal.